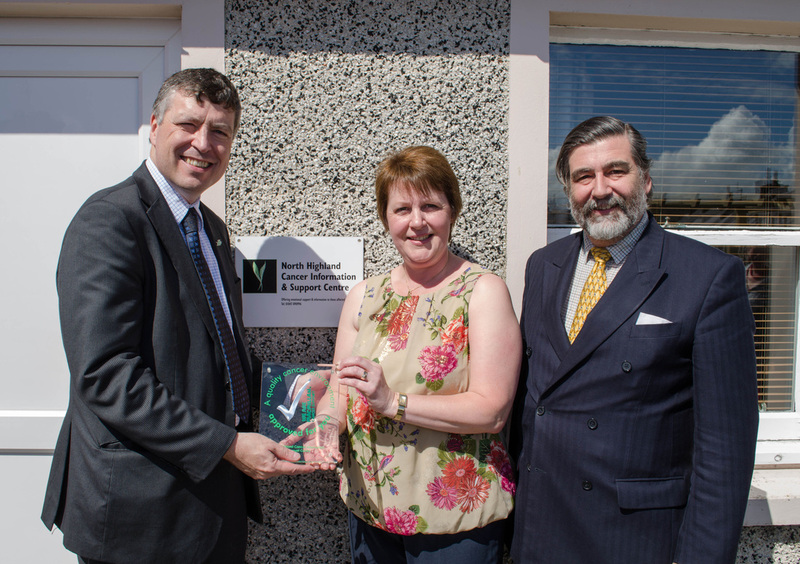 The North Highland Cancer Information & Support Centre in Thurso received the Macmillan Quality Environment Mark by CEO of Macmillan Ciaran Devane who travelled north for the presentation at the centre. The award is only the 15th to be presented in Scotland to a cancer care facility and although the Thurso centre is an independent charity it was able to apply for the award as it fitted the criteria. Before the presentation of the award John Thurso MP spoke of his delight at being able to revisit the centre and learn of its success since opening it in May 2008. He said it was an important service to the local community and congratulated everyone for their hard work. John Thurso then introduced Ciaran Devane CEO of Macmillan to present the award to chairman Jennifer Iornside. Ciaran said he was pleased to make the journey north for the presentation and was impressed by the level of enthusiasm by all involved with the centre. Jennifer Ironside thanked the invited guests for coming along to help celebrate this achievement and spoke of the commitment and dedication by the volunteers which has made the centre the success it is today. Jennifer said “work towards gaining the Macmillan QEM has made us look much closer at the service we provide and over the past year we have worked hard at fine tuning much of what was already in place as well as introducing recommendations through the Macmillan QEM.” Jennifer also thanked the numerous individuals and organisations that have given donations to the centre. The North Highland Cancer Information & Support Centre is a small independent charity who rely on donations from the local community to fund the service.